﻿I can’t remember when I first knew about Gertrude Stein and her writing. It was a very long time ago and I think I must have seen her name in a book about Picasso. (The literary and artistic circles of post WWI Paris grab me every time). I started by reading Stein's The Autobiography of Alice B. Toklas and loved every word of it. This was the art world, Paris and gossip of the era all rolled into one. I won't even pretend to tell you much about Gertrude Stein because I'm no biographer. But.....if you aren't familiar with her......Gertrude was born in Pennsylvania in 1874. She moved to Paris, 27 rue de Fleurus in 1903, living first with her brother Leo, and later with Alice, her lifelong companion. She remained in Paris until her death in 1946 and is buried in the Père Lachaise cemetery. 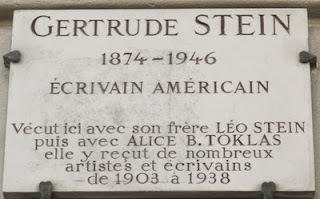 (Alice was also buried in Père Lachaise near Gertrude. It's interesting to note that Alice's name is carved on the back of Gertrude's headstone). Stein’s influences came from Cubism and the art world she loved. Although I absolutely devoured The Autobiography, Wars I Have Seen, and Paris, France, I can’t say I enjoy Gertrude’s other writings. I know she was a modern, and “a rose is a rose is a rose” is interesting, but I just can’t seem to get through an entire book. 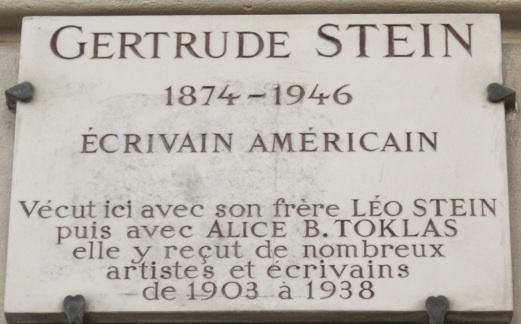 The Autobiography of Alice B. Toklas was written by Gertrude (which in itself is funny). The book caused a lot of hard feelings as she seemed to be "truth challenged". 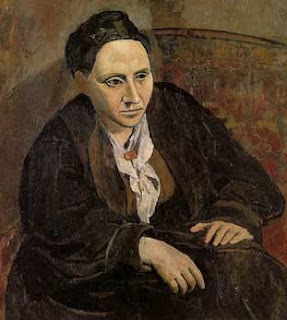 There was a Testimony Against Gertrude Stein published by six artists/writers mentioned in the book. Hemingway thought it was trash, Matisse was offended, Braque thought she didn’t understand Cubism and Leo, her brother, said it was full of lies. Exactly! That’s what makes a best seller! And a best seller it was it was it was! She wrote it to make money (which it did), but she didn’t consider it an artistic achievement (which, I guess, it wasn’t). Still, it’s wonderful reading. I think I would have liked Gertrude and Alice. They were funny, they loved art and literature and, of course, Paris. We visited 27 rue de Fleurus. It doesn't look like much outside, but with a little imagination, you can picture what and who were inside. (The French are so great at marking places of historical interest). Having missed out on reading my favourite blogs while I've been away in France I'm now taking advantage of a few hours to catch up. Just off to read your other posts I have missed. Warmest wishes from a misty UK - well it's either misty or my spectacles need cleaning again. Glad you dropped by Carol. Have been reading your posts and enjoy every word. You really make me LOL!! Skiing lessons! Ha ha ha. If you decide to read anything by Gertrude Stein, pick up the Autobiography of Alice B Toklas first. A good read! A bientot!